The Teamster’s President James Hoffa praised President Trumpss’ move to crush the Trans Pacific Partnership. By the expected addition of 6 million more Manufacturing Jobs coming back to America over the next 4 years Union Membership should sky rocket and pension funds will thus be stabilized. Unbelievable - the Union Leaders praising a Republican President. Second - President Trump also signed a bill to push through the Keystone Pipeline - from North Dakota to the Mississippi River. America will not only be energy independent it will also eliminate the US Trade Deficit within 3 months. Fourth - Storms across the Central US are tearing it apart. Look at the wind map - Bizarre. Please pray that these Intense Storms calm down into Gentle Rains and Gentle Winds. Firth - President Trump has terminated funding to groups that conduct Abortions outside of America. Apparently WE in America have been paying for abortions world wide. President Clinton initiated this, President Bush Cancelled it, President Obama reinitiated it and now President Trump has again cancelled these payments. Sixth - As the Sun begins to expand the extra energy can be directed out to see to release the excess energy now hitting the Earth. Finally - Please pray with me that Radio Host Pastor Rick Wiles foot heals from the hairline fracture he received a few days ago when he actually slipped on a wet floor while working. First - we love having you in office. If offered a trip on a Boat of any kind next month - say no. Second - A Pylon on Air Force 2, which I believe is now Air Force 3 as of yesterday, is cracked. Remember the “Engine” that supposedly fell off a B-52 last month - hint, hint…. Third - Madonna threatened to blow up the White House and Glenn Beck threatened to stab you over and over again - they are very dangerous people - as is Rosie O’Donnell and her friends. You need to deal with them immediately. Fourth - wear magnets in your pockets to eliminate the effects of the Electronics in the wall. If you need some ask. Fifth - No more clicking cameras - they need to go No-Flash digital Cameras. Period. Someone is trying to give you a seizure. Sixth - The New Software Upgrade on Air Force One causes flickering in the program - it has “Lowest Bidder Syndrome“. 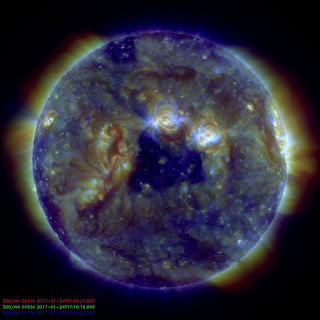 You might seriously reconsider not upgrading the computers on Air Force 2 (It is about to happen) and 3 until this glitch is worked out. Finally - You have a mole. The man giving Hand Signals after escorting you into the Armored Limo - Completely Loyal - but…. Payoffable. Please bring people into the White House who can detect those things. We, the people, want you around for the next 8 years as a fully functional and incredibly successful President. Please pray that President Trump is well protected and every evil plan is thwarted his reviving of America fails. Please also pray for your families - the storms running across the world are getting more and more intense. Age Backwards - you avoid the doctor. Last night Jane was up almost all night - an effect of our Anti-aging Process and her face - wowzers - as the wrinkles subside. She plans to show her “New Face” to all her friends this week. 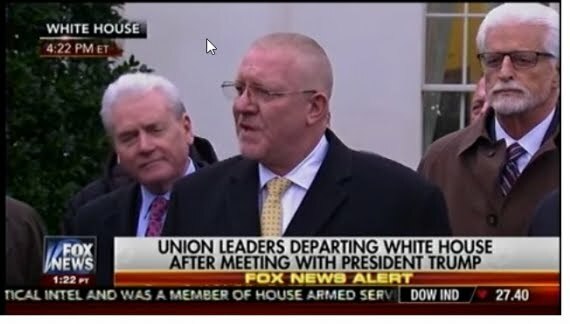 UNION LEADERS STUNNED AS THEY LEAVE WHITE HOUSE! Did you know you can get them AUTOMATICALLY AND ABSOLUTELY FREE by using Like 4 Like?